The average person’s hand does not move very quickly while brushing. Even at top speed, a hand cannot move fast enough to compare to the speed of an electric toothbrush. The bristles of an electric toothbrush swirl rapidly over the teeth, sweeping away more plaque and food particles and covering all surfaces effectively. Since the electric toothbrush does most of the work, users do not have to put much effort into their tooth cleaning routine. All they need to do is apply the toothpaste, turn the toothbrush on, and move it over all tooth surfaces, including the front and the back of teeth and over the flat surfaces of molars. Individuals who have problems with their hands or wrists, such as missing or paralyzed fingers, carpal tunnel syndrome, arthritis, or similar conditions, may find that an electric toothbrush is the only way that they can conduct an effective oral hygiene routine on a daily basis. The design of most electric toothbrushes enables them to reach some areas that are hard to clean with a manual toothbrush. The areas of the teeth nearest the gums, as well as the crevices in between the teeth, are often havens for bacteria. Electric toothbrushes have bristles that move fast and clean deeply, so they can reach into all of these cracks, curves, and crevices to extract food particles and harmful bacteria. The motion of the brush supplies more pressure and power, scrubbing away at any layers of plaque. 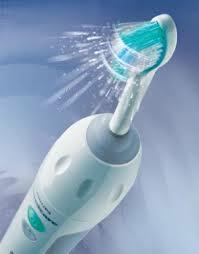 Electric toothbrushes are designed to accomplish thorough, deep, fast cleaning. Some buyers who are considering an electric toothbrush may wonder if such efficient cleaning might leave their mouth and their gums sore afterward. If their gums are already inflamed due to lack of proper oral hygiene, they will likely be sensitive to any kind of brushing, whether it is electric or manual. However, with regular brushing twice a day, as well as daily flossing, the teeth and the gums should become healthier. For a healthy set of gums and teeth, an electric toothbrush should cause no pain or discomfort at all. Its bristles are stiff enough to get the job done, but they are also soft enough to avoid irritating the gums. In today’s busy society, people often rely on drinks that contain caffeine, such as coffee, hot tea, iced tea, and soda. These drinks are one way that employees, students, and travelers keep themselves mentally alert and physically energetic. However, the frequent consumption of drinks like coffee and tea can eventually cause discoloration and staining of the teeth. The extra scouring power of an electric toothbrush makes it easier for users to remove unwanted stains and whiten their smile. Bad breath, or halitosis, occurs when foul odors emanate from the mouth and are noticeable to other people. Bad breath can be made worse when people eat foods like onions, dairy products, garlic, or fish, or when they consume coffee, alcohol, or smoke cigarettes. Sometimes, halitosis can be caused by the presence of bacteria or plaque in the hidden recesses of the mouth. It is important for users to take full advantage of their electric toothbrush and its ability to reach back far into the mouth. The top of the tongue, under the tongue, and the back area of the mouth around the molars are sometimes tough to reach. An electric toothbrush allows for easy and efficient cleaning of those areas, creating both a cleaner mouth and fresher breath. Some people purchase a new electric toothbrush, hoping that the novelty of the product will inspire them to brush more regularly. Unless users are dedicated and consistent in their brushing routines, they may not experience any significant positive change in their oral health. However, several studies have shown that if users employ electric toothbrushes as recommended, they will experience an 11 percent reduction in plaque and a six percent reduction of gingivitis (gum disease) when compared to users who brush regularly with manual toothbrushes.